During this COCA Call, clinicians will learn about synthetic cannabinoids, their clinical effects, and the role clinicians can play in the public health response. During this COCA Call, participants learned about the epidemiology and clinical manifestation of Zika virus disease and how early recognition and reporting of suspected cases can mitigate the risk of local transmission. During this COCA Call, clinicians learned about the components of Million Hearts® and the strategies to help find and address the needs of those at greatest risk for cardiovascular disease. During this COCA Call, clinicians learned about 2015-2016 influenza activity, heard an overview of CDC’s current recommendations for vaccination and antiviral medications, and gained insight into data supporting the recommendations. The birth prevalence of microcephaly in Brazil increased sharply during 2015–2016. The suggested link between maternal exposure to Zika virus infection during the first trimester of pregnancy and the increased birth prevalence of microcephaly provide additional evidence for congenital infection with Zika virus. Ongoing surveillance is needed to identify additional cases and to fully elucidate the clinical spectrum of illness. Pregnant women should protect themselves from mosquito bites by wearing protective clothing, applying insect repellents, and when indoors, ensuring that rooms are protected with screens or mosquito nets. This report provides information on six confirmed and probable cases of sexual transmission of Zika virus from male travelers to female nontravelers. This report provides preliminary information on testing for Zika virus infection of U.S. pregnant women who have traveled to areas with Zika virus transmission. CDC has updated its interim guidelines for U.S. health care providers caring for infants born to mothers who traveled to or resided in areas with Zika virus transmission during pregnancy and expanded guidelines to include infants and children with possible acute Zika virus disease. Updated guidelines include a new recommendation to offer serologic testing to asymptomatic pregnant women (women who do not report clinical illness consistent with Zika virus disease) who have traveled to areas with ongoing Zika virus transmission. This update also expands guidance to women who reside in areas with ongoing Zika virus transmission. Local health officials should determine when to implement testing of asymptomatic pregnant women on the basis of information about levels of Zika virus transmission and laboratory capacity. 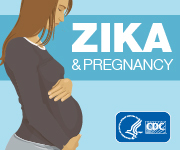 CDC is issuing this HAN Advisory as a strong reminder to state, local, and US territorial public health departments, clinicians, and the public to be aware of and adhere to current recommendations for preventing sexual transmission of Zika virus, particularly for men with pregnant partners. CDC has developed an easily embeddable collection of Zika Virus information for partner and stakeholder websites. This collection, called a microsite, can supplement partner web sites with CDC’s up-to-date, evidence-based content. The primary way Zika virus is spread to people is through mosquito bites. The most common symptoms of Zika virus disease are fever, rash, joint pain, and conjunctivitis. Transmission of the virus from mother to newborn can occur if the mother is infected with the Zika virus near the time of delivery. Teva Pharmaceuticals announced a voluntary recall of one lot of amikacin sulfate injection USP, 1 gram/4mL (250 mg/mL) vials due to the potential presence of particulate matter identified as glass in one vial. The recalled lot # is 4750915, Expiration Date 9/2017. On March 7, 2016, FDA recommended that I.V. Specialty cease sterile production until appropriate corrective actions are implemented, and recall all non-expired drug products intended to be sterile. The company has neither ceased sterile production nor initiated a recall. Therefore, FDA is alerting health care professionals and patients to dispose of and not use drug products intended to be sterile that were produced and distributed by I.V. Specialty. Sagent has initiated a voluntary recall of one lot of Fluconazole Injection, USP, 200mg per 100mL to the user level due to the discovery of an out of specification impurity result detected during routine quality testing of stability samples at the 18-month interval. This impurity has been identified as Metronidazole. An elevated impurity has the potential to decrease effectiveness of the product in patients.